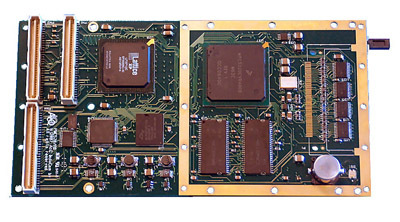 The PMC408 is an intelligent quad channel CAN controller, suitable for the standard CAN2.0B, but also for the new CAN-in-aerospace, ARINC-825 protocol. The PMC408 also features a digital input channel, which may be used for time synchronization. The applied signal might be 1PPS or IRIG-B, with respect to the onboard input. This card is also available as a conduction cooled version (ccPMC408). The PrPMC520 has a maximum of 256MByte SDRAM and a maximum of 32MByte Flash memory to store your application program and data. Also available is a development carrier card for the PrPMC520. This carrier card is meant for software development purposes. It has all kind of connectors and signal conditioning.